GPS-based guidance systems have been the primary precision agriculture technology adopted by producers and custom operators (Litton et al., 2013). In fact, guidance has become a standard option on most large agriculture machinery in part because it improves machine operation and in-field accuracy over long working days. Manual steering is demanding for a machine operator often resulting in operator fatigue and poor driving performances (Heraud & Lange, 2009). Guidance technology provides a machine operator the ability to accurately operate a defined field pattern. These systems also improve driving performance by reducing the number of skips and overlaps as well as limiting crop damage during field operation (Price, 2011). Further, guidance technology improves the efficient use of crop inputs such as seed, pesticides and nutrients along with increasing yield potential, thereby enhancing farm economic potential. Other benefits of guidance systems include the ability to operate under poor visibility conditions, including night, accurate placement of inputs, and the ability to manage around environmentally sensitive areas within fields. This publication presents a farm case study in which guidance lines were optimized for individual fields to increase field efficiency and/or capacity. 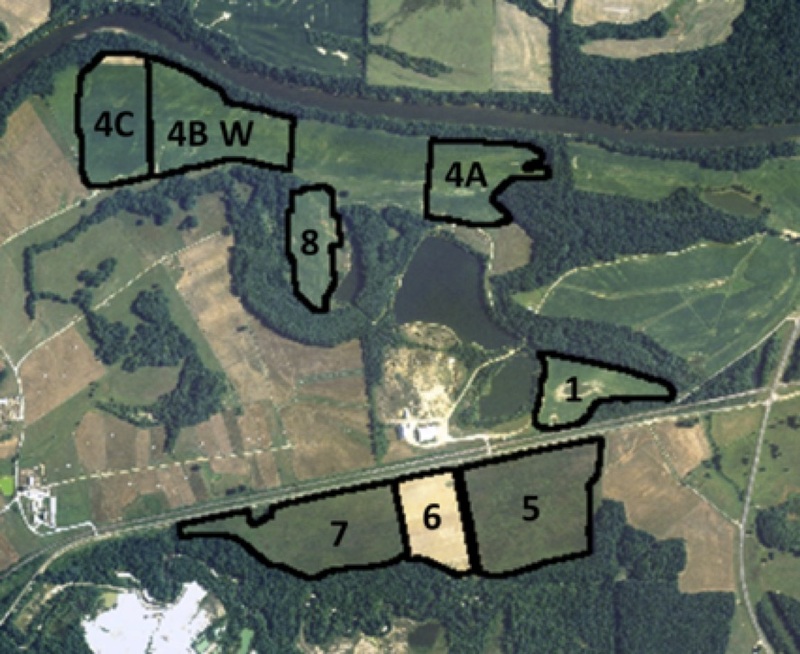 In this example, the producer was consulted about equipment size, and precision agriculture technology being used, while providing eight field boundaries to conduct the optimization analyses. The overall intent was to develop a methodology that establishes optimum guidance lines for individual fields then compare results to the current guidance lines used by the producer. Figure 1. Aerial image with overlain field boundaries and naming convention used in this study. This case study was conducted at a farm near Shorter, Alabama. The producer utilized precision agriculture technology that included guidance, variable-rate technology and automatic section control. More specifically, the tractor used during planting was equipped with RTK auto-guidance while the row-crop planter included hydraulic drive and individual row-unit automatic section control. The same tractor was used for side-dress applications of nitrogen, with the sprayer having guidance, rate control and automatic section capabilities. The producer’s preference was to use straight guidance lines mostly due to towing a corn silage harvester, and because he could maintain the same guidance lines from year to year for an individual field regardless of crop. The producer believed that straight guidance lines reduce loss during harvest. Eight fields were selected, each with existing GPS field boundaries (Figure 1). The naming nomenclature defined by the producer was maintained for this project. Essential features included fields of varying size and shape. Field 5 was somewhat square in nature while others were more rectangular (e.g. Fields 4C, 6 and 7). Other fields were irregularly shaped (field 4B W and 4A). All fields were fairly flat with no terraces or other conservation structures influencing the cropped land within each field. The existing guidance lines were all straight and had been established by the producer using the existing RTK auto-guidance technology. The direction of the guidance lines essentially followed the equipment field pattern used over time and prior to the adoption of precision agriculture technology at this farm. The seven existing guidance lines were exported from the RTK auto-guidance system and archived to incorporate into this study. The optimization routine focused on planting as this field operation establishes the direction and orientation of crop rows for the entire growing season. The producer used a 6-row planter on 36-in. row spacing or 18-ft total width. ESRI’s ArcMap and Microsoft Excel software packages were deployed to develop the optimization routine and summarize results, respectively. The field boundaries were loaded into ArcMap. The method started by generating a line oriented N-S (0° bearing) extending beyond the field boundary spatial extents (e.g. a line longer that extends beyond the boundary regardless of degree orientation) representing an initial AB line or traffic pattern. Parallel lines at a distance of 18-ft were then generated using ArcToolBox to ensure the field was fully covered beyond the extents of the boundary. These lines were then clipped to the field boundary and saved as a layer for optimization analysis. Then, 35 additional traffic patterns were produced incrementing the AB line bearing by 5° each time generating a set of 36 path layers for each field. Also included in this analysis were the original AB lines established by the farmer. Thus, each field had a set of 37 unique traffic paths. The optimization routine computed the average pass length, the number of turns and the total turning distance. The optimum path or AB line was established by maximizing the length of passes while minimizing the number of turns and total turning distance. Based on the results, fields were then classified in three categories. Category 1 represented fields that were regularly shaped, where the establishment of optimum paths was intuitive (fields 4A, 4BW and 6). 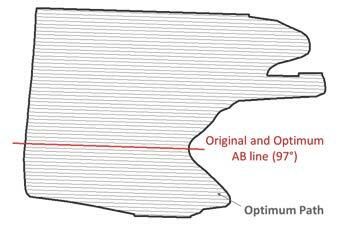 Category 2 were fields that were irregularly shaped, and where a minor change in AB line orientation would slightly improve field efficiency (fields 1 and 8). Finally, Category 3 characterized fields where a major change in AB line orientation greatly improved field efficiency. The optimal AB lines had not been apparent to previous machine operators. Table 1. Field identification along with category and original AB line bearing. The defined traffic patterns were then used to suggest adjustments to field boundaries. In some cases, aspects of the field boundary could be squared to better accommodate machinery and implements, while maintaining filed efficiency. Boundary management is important today to those implementing precision agriculture technologies and practices. In some fields, field traffic patterns were intuitively the best, and no adjustment of AB lines is necessary. For example, the original path in Field 4A (Fig. 2) already minimized the time to perform field operations. However, the field boundary was adjusted to traffic patterns, and so a slight improvement was achieved by squaring the boundary edges. Figure 2. Example illustration of a field within Category 1 where the existing AB line already maximizes machinery efficiency; Field 4A shown. 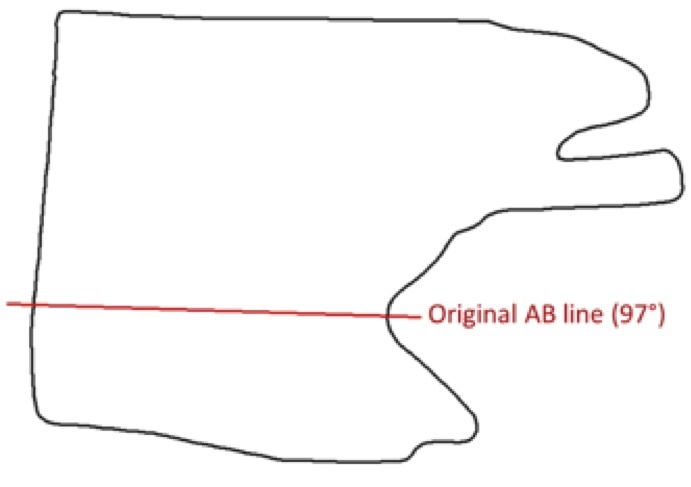 Current AB line and original boundary (a) compared to re-defined field boundary (b) using this AB line, with squaring of boundary edges. Fields 1 and 8 are more irregularly shaped than fields in category 1 and a minor change in AB line orientation significantly increased field efficiency. In the case of field 1, a slight adjustment of 4.4° in AB line orientation enables a decreased total turn distance by 17%. In the case of field 8, a small adjustment of 3.4° results in an increase in the length of each pass by 3% and decreases the number of turns by about 5%. Field boundaries were re-defined as presented in the previous category. Results obtained for field 1 are presented below (Figure 3). Figure 3. 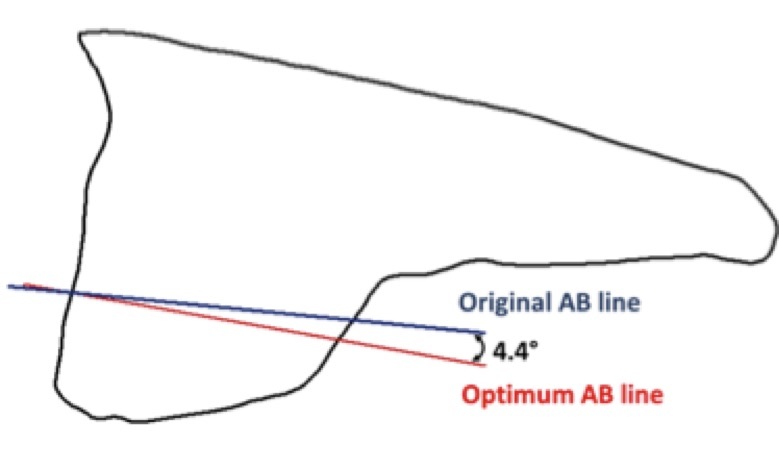 Example of Field 1 results for a category 2 field: a small adjustment of AB line orientation increased machinery efficiency; (a) Original versus optimum AB line overlain on original Field 1 boundary; (b) Optimum path or AB lines along with adjusted field boundary on the north and south sides. Both regularly and irregularly shaped fields enter into this category and, historically, all traffic paths were perpendicular to the principal direction of elongation of the field. 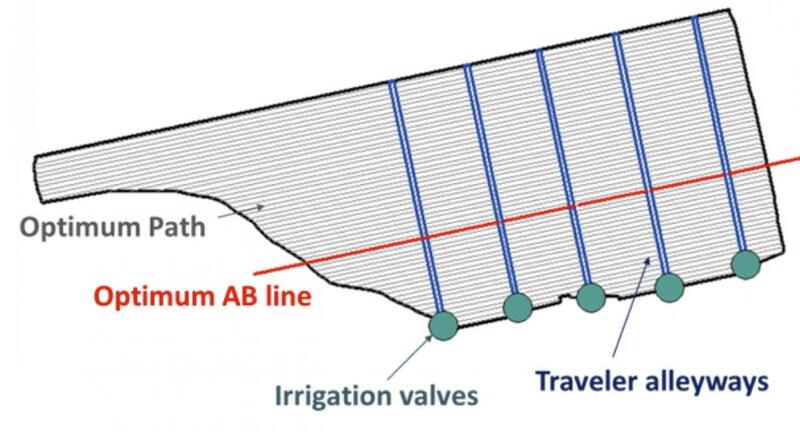 Current AB lines were directly adapted to this historical management strategy, which was established because of the use of travelers for irrigation. Indeed, travelers are too short to cross the field along its longest dimension. Therefore, irrigation valves were installed along the longest edge of the field and travelers were shifted perpendicularly to this direction. Then, due to soil roughness generated by moving the travelers in the fields, field patterns were established parallel to the traveler alleyways (Figure 4). However, rotating the AB lines from 170 to 80 degrees in this Field 7 would increase the length of passes by 154%, and decrease the number of turns by 62%. Figure 4. Establishment of current AB line for irrigated fields (example of field 7) based on historical field management. Current AB line were drawn parallel to traveler alleyways in the field, and used original field boundaries. A solution was found for this particular farmstead which enabled the producer to use the optimum AB lines while maintaining irrigation using travelers. This solution relies on recording the spatial position of the traveler alleyways in an irrigated field, the use of row shut-off clutches, with additional precision technology added on the planter. Planting would be performed along the optimum passes using automatic row shut-off technology. When crossing the passes previously recorded, individual row clutches would automatically stop to release the seeds into the ground, generating areas with no seeds in place of the traveler alleyways (Fig. 5). Disks would then be used in these alleyways, when required, to smooth soil surface and facilitate following operations in the field over the entire growing season (Fig. 6). Benefits of implementing this new strategy would be twofold for the producer. Firstly, it would considerably improve field efficiency while maintaining irrigation. Secondly, savings on seed costs would be attained by establishing no-plant in traveler alleyways. Field boundaries were revised to better accommodate machinery and implements, while benefiting from the predicted improvements in terms of field efficiency. For this Field 7 example, adjusting the paths or AB line along with field boundary (Fig. 6) increased the length of passes by 154% while reducing the number of turns by 62% for 18-ft equipment. Figure 5. 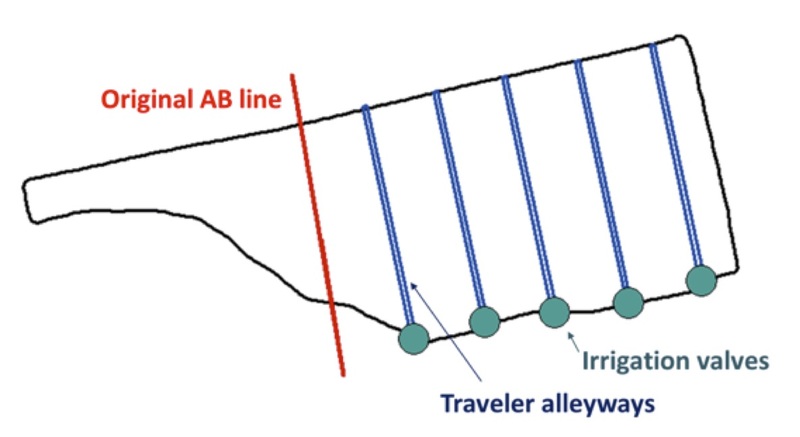 Illustration of using planter row-shut off technology to implement the optimum AB line within Field 7 establishing a no-plant zone or traveler alleyway eliminating crop damage. Figure 6. The revised path plan for Field 7 implementing the optimum AB line. Planter automatic row shut-off technology and redefinition of field boundary enabled execution of this new path plan while accommodating current planting equipment and irrigation requirements. Table 2. Comparison of the results obtained between the two optimization methods. For each field, the FMIS (SMS AgLeader™) results were within 2 degrees to those obtained through the optimization routine using a 5° precision, i.e. both optimization algorithms gave the same results. Thus, AgLeader™ SMS, and probably other FMIS software packages, allow farmers to evaluate their traffic patterns and potentially improve their agricultural machinery operational efficiency through path planning. GPS-based guidance systems permit accurate driving of agricultural vehicles within a field, thereby providing numerous benefits which contribute to increased farm economic performance. Guidance systems also can be used to optimize a producer’s management strategies, and increase field efficiency and improve machine management, especially in irregularly shaped fields. Path patterns in fields with regular shapes were intuitively determined by the producer and maximized field efficiency. However, a small adjustment of the pass orientation in more irregularly shaped fields resulted in a significant increase in field efficiency. However, in irrigated fields, a major change in pass orientation radically increased field efficiency, but would have prevented use of irrigation travelers. The solution consisted in using row shut-off technology on the planter to create a no-plant area establishing defined traveler alleyways. Of benefit to producers and their data service providers, a FMIS (AgLeader™ SMS) provided results comparable to the optimization technique developed using GIS functionality. SMS can quickly and cost effectively be used to determine the optimal AB line (guidance layer). It is also important to understand that soil type, slope length, tillage system, and crop rotation factors may override any ideal field efficiency calculation. In general, slopes of 3% or higher should be treated differently than fields with flatter terrain. 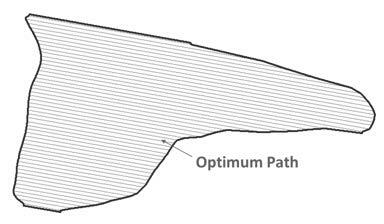 Planting and any tillage is generally recommended to be on the contour of slopes, but in so many cases with rolling hills and inconsistent field slopes, this is not possible. ACES. (2010). Considerations for Adopting & Implementing Precision Ag Technologies. Precision Agriculture Series Timely Information publication, October 2010. Alabama Cooperative Extension System. 2 pg. Adamchuck, V. I. (2008). Satellite-Based Auto-guidance. Extension Circulator EC706, University of Nebraska Lincoln–Extension. Grisso, R. D., Kocher, M. F., Adamchuck, V. I., Jasa, P. J., & Schroeder, M. A. (2004). Field Efficiency Determination Using Traffic Pattern Indices. Applied Engineering in Agriculture, Vol. 20(5): 563-572. Heraud, J. A., & Lange, A. F. (2009). Agricultural Automatic Vehicle Guidance from Horses to GPS: How We Got Here, and Where We Are Going. Equipment Technology Conference (pp. 1-67, ASABE Publication Number 913C0109). Louisville, Kentucky, USA: American Society of Agricultural and Biological Engineers. Price, R. R. (2011). A General Method to Illustrate the Different Field Efficiency Gains of Guidance Systems. ASABE Annual International Meeting, (Paper Number: 1110848). Louisville, Kentucky. Renoll, E. (1981). Predicting Machine Performance Rates for Specific Field and Operating Conditions. Transactions of ASAE, Vol. 24(1): 45-47.